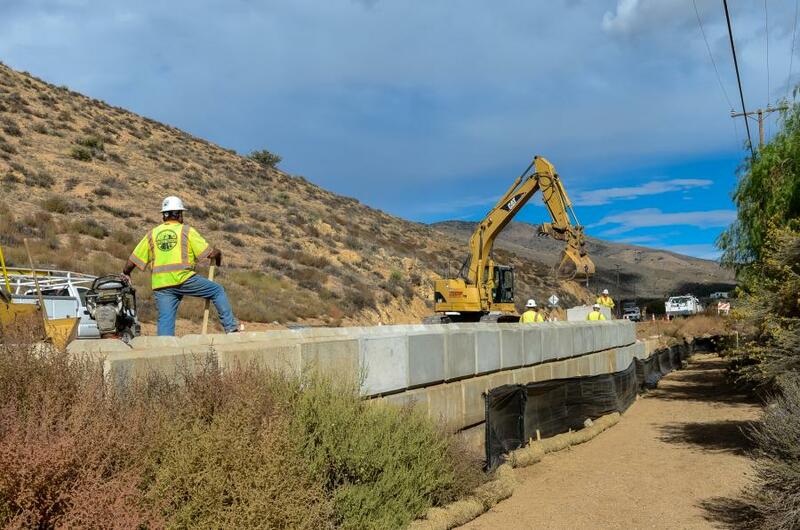 In San Diego County, erosion along a bluff in Del Mar posed a threat to a major sewer line and gas main and forced the closure of the southbound lane of the roadway between Fourth Street and Carmel Valley Road. Winter came on strong in California during the first full week of January, bringing rain, snow, flooding and rockslides, and keeping repair crews busy. Some streets and highways had to be closed for repairs following a bout with El Nino, which tends to bring wet winters to the Golden State, known for its abundance of sunshine. In addition, mud had to be cleared from streets in hillside areas like the Colby Fire burn area near Azusa and Glendora. The area has been hit by four mudslides in two years in an area left barren from a 2014 fire. More than 20,000 tons (18,144 t) of mud has flowed out of the hills in Los Angeles County. Highway crews closed Glendora Ridge Road between Glendora Mountain and Mt. Baldy roads as a precautionary measure. The road was expected to reopen on Jan. 18. Also, State Route 39 is closed at East Fork Road north of West Covina because of a mudslide. Caltrans is assessing what should be done to address the mud slide situation. A steel barrier is one possibility, said Micole Alfaro, Caltrans spokesman. “Overall things are holding up, but we were inundated by a lot of rain,” Alfaro said. The Colby Fire burn area is under a yellow alert, which restricts parking in the area. Until then, the threat of mudslides remains. However, Los Angeles Public Works has been successful in blocking slides by installing interlocking walls of cement, wood and steel that allows water to pass through, but not mud and debris. 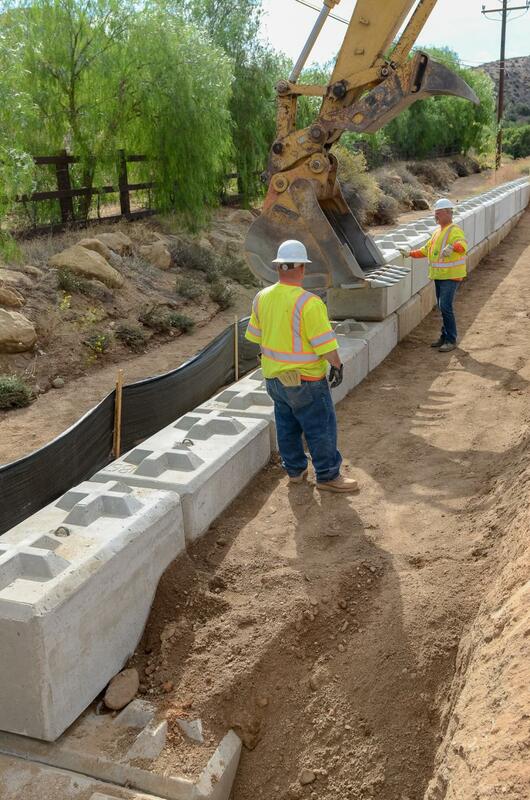 The walls, which resemble huge Lego pieces, have been installed at various locations including the Santa Clarita area and above a mobile home park in Newhall. Also in Los Angeles County, flooding was reported in the Sepulveda Basin, a flood-control area along the Los Angeles River, causing street closures in the area. The recent rains brought the Los Angeles rainfall total from Oct. 1 to present to 3.97 in., which is still under the normal amount of 4.62 in. for the period. Weather conditions improved the week of Jan. 11, but repair crews were busy assessing and repairing damage. The bluff area is beneath Camino Del Mar, site of the sewer line. 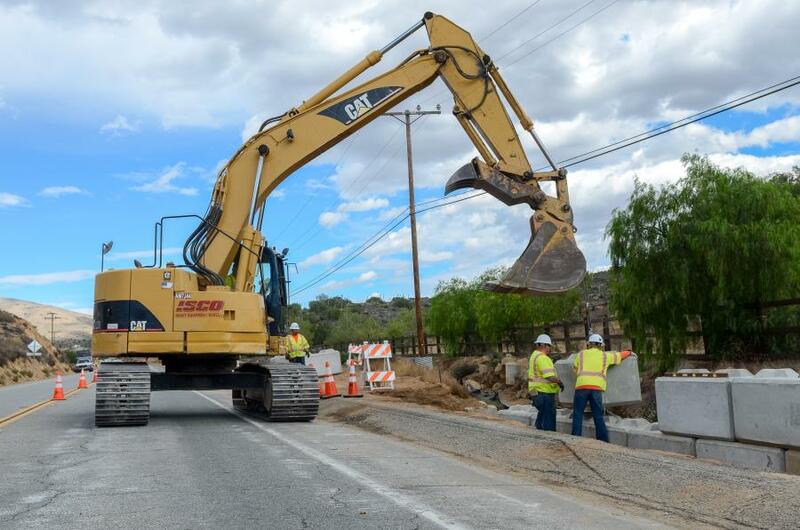 On Jan. 13, work crews were able to reconfigure the roadway so single northbound and southbound lanes could open. Normally the street has one southbound lane and two northbound lanes. The City of Del Mar is still assessing the damage, but it appears the repair cost will be hefty. The gas main and sewer line will likely have to be relocated. And at least a portion of the roadway will have to be rebuilt. Eric Minicilli, public works director, said the repair cost would likely run between $1 million and $2 million. “It could have been worse,” Minicilli said, adding that rains inundated the area with water. Heavy rains in San Diego County also toppled trees and created sinkholes. 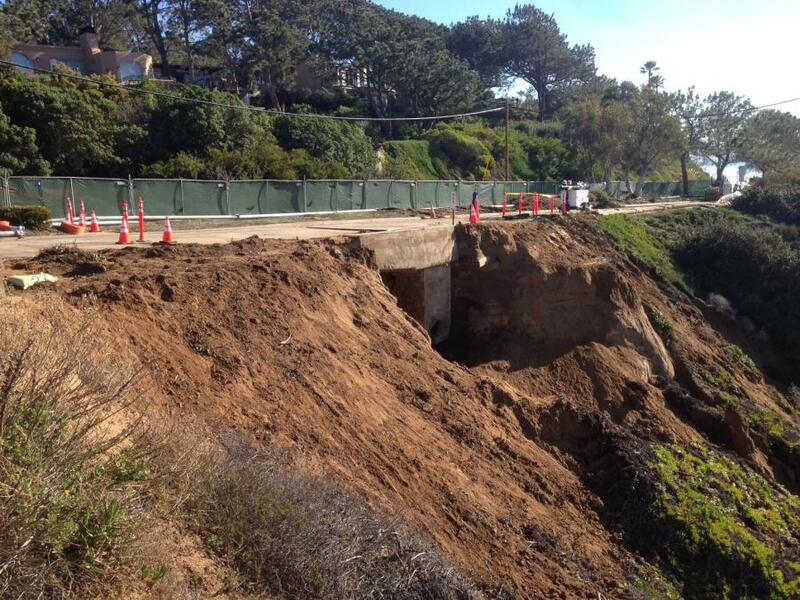 In La Jolla Shores, a sinkhole opened up on Jan. 6 near Avenida de la Playa and Camino del Oro. The hole, larger than the size of a car, exposed a gas line, according to a report by San Diego Gas and Electric. The line, which remained intact, connects to the La Jolla Shores Hotel. At Point Loma, west of San Diego, some residents experienced flooding to their homes. In San Diego, the County of San Diego Health and Human Services on Rosecrans Street temporarily closed because of storm damage. Rains and flooding in inland San Diego County brought down large boulders onto Old Castle Road in Valley Center. The rains boosted San Diego's rainfall total from Oct. 1 to 5.83 in., compared to the normal of 3.83 in. To the north in Vista, strong winds damaged eight homes and knocked out power to residents on Jan. 6. Nearby in Fallbrook, Main Street from Ammunition to Fallbrook streets was closed because of a water main break. Also crews closed Aviation Road from South Mission Road to Old Stage Road because of a water main break. In Sorrento Valley, a FedEx building had to be evacuated after rains caused a partial roof collapse. Meanwhile Southern California mountain areas had problems of their own. At Big Bear Lake 8,000 people were left without power on Jan. 7 after 2 ft. of snow fell in the area. In the northern part of the state, El Portal Road, a continuation of Highway 140 into Yosemite Valley, was closed for a time following a Jan. 7 rock fall. 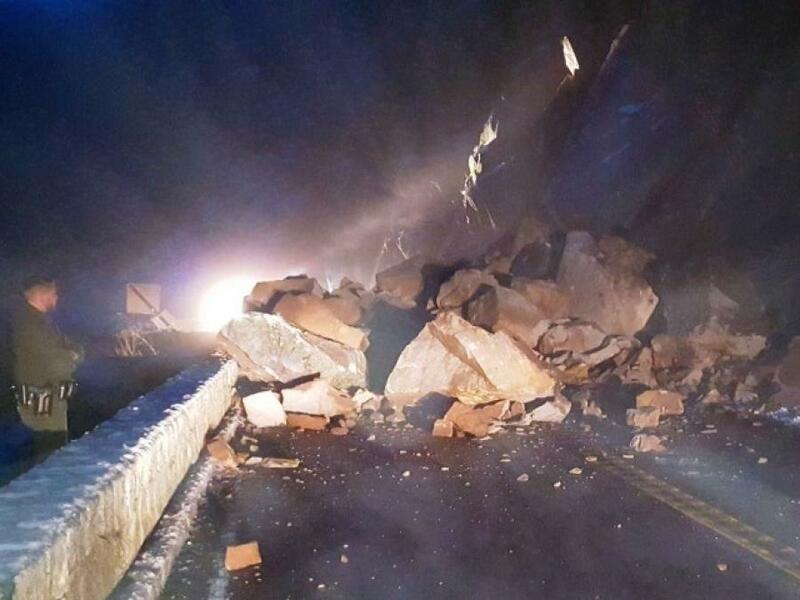 The rock fall sent massive boulders, rocks and debris onto the scenic roadway. The roadway since reopened according to the Yosemite National Park Web site. The rock fall occurred below the Arch Rock Entrance Station in the area of the Oct. 2014 Dog Rock Fire. Fortunately no injuries were reported. Meanwhile, Tioga Road (Highway 120 through the park) and Glacier Point Roads are closed for the season because of snow. In the Central Valley, some orchards were flooded after heavy rains, but most farmers welcomed the precipitation after four years of severe drought. Meanwhile road closures were numerous because of flooding and mudslides. Heavy snow and rockslides closed some major mountain roads. But not all was gloom and doom. The rains were welcomed by many in the area. As of press time, Caltrans reported that State Route 3 in Northern California is closed because of snow from 20 mi. (32 km) north of Trinity Center in Trinity County to 3 mi. (4.8 km) south of the town of Callahan in Siskiyou County. In Northern California's Sierra Nevada range, State Route 89 is closed from 5 mi. (8 km) north of U.S. 50 to Bliss State Park in El Dorado County because of avalanche control. In Central California, State Route 140, 20 mi. east of Mariposa, was reported closed to vehicles more than 45 ft. (13.7 m) long. All other vehicles will find one-way controlled traffic. Workers are making slide repairs along the highway.